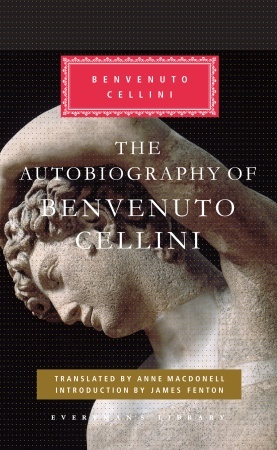 The Autobiography of Benvenuto Cellini, translated by Anne MacDonell. New York: Everyman’s Library, 2010. Written between 1557 and 1565: that is to say, 450-460 years ago. Cellini (1500-1571) is pronounced, in case you were wondering (and I hope you were unless you already knew), Chelleenee or Chulleenee, because Italian is cool like that. “Cellini’s Life belongs, with Rosseau’s Confessions and Berlioz’s Memoirs, to the very top of modern autobiographical literature. There had been nothing remotely like it before.” (Introduction by James Fenton, page viii). If artists sometimes (often!) have a wild reputation, Cellini is a real wild piece of work who in turn created very fine pieces of work. He was a bit of a rogue and definitely his own person, alternately working and fighting with popes, cardinals and royalty, peers, colleagues and so on, killing a few enemies and suffering stints in prison along the way. The miracle is that he lived to be 70. Some choice quotations may help establish an idea of his disposition and arc. Though he had indeed committed crimes, at one point a new pope chides one of Cellini’s critics: “’I know better of such things than you. Learn that men like Benvenuto, unique in their profession, are not subject to the laws. And especially in this case with him, for I know how greatly he has been provoked.’” (page 136). Cellini is provoked again, this time by a man who refuses to pay him what he's owed. "Now I had it in my mind to chop off one of his arms; and assuredly I should have done it; but my friends thought it was not wise for me to do such a thing . . . I gave heed to their advice -- though I should have liked to have treated the business with a freer hand . . ." (pages 188-189). In France, another Cellini nemesis tries to undercut him, saying to the King of France that he wouldn't complete his work. "To this the King replied that he who worried so anxiously about the end of a piece of work would never begin anything." (page 268) Truer words rarely spoken. "are not subject to the laws. And especially in this case with him, for I know how greatly he has been provoked." I am greatly provoked as well but it seems them doing the provoking are the ones not subject to the law. Oh how twisted the world has always been. Sounds like he would have fit into the modern world. I love his prefer to act with a "free hand"